Sorry, this product is no longer available, replaced by the M270. Because smaller companies are generally less protected and easier to break into, small business has become the new big target for cyber attacks. The Firebox M200 and M300 firewalls are specifically engineered to defend all types of small businesses against attacks that are no less fierce than those targeting larger organizations. Firebox M200 and M300 Next-Generation Firewall (NGFW) and Unified Threat Management (UTM) solutions are up to 218 percent faster than competing products with all security layers turned on, and up to 385 percent faster performing HTTPS inspection, ensuring businesses never have to compromise network security for performance. Comprehensive Protection - Best-of-breed security services boost protection in critical attack areas, including gateway AV, URL and web content filtering, intrusion prevention, app control, and spam blocking. Real-time Visibility - A suite of big-data style visibility and reporting tools are included with your Support contract. Use the Policy Map dashboard to quickly find active and misconfigured policies and drill down as needed. Layers of Defense - WatchGuard offers eight security subscriptions for the M200 and M300, so businesses can build up protection where they need it most. Subscriptions can be purchased individually or bundled together for even greater savings. Outstanding Performance - Up to 4 Gbps firewall throughput. Turn on optional security services and still see up to 800 Mbps throughput. 3 Ways to Manage Your Appliance - You have the power to choose how you manage your WatchGuard appliance, including WatchGuard System Manager, the command line interface, and a web UI for access from anywhere, anytime. Maximum Network Uptime - High availability capabilities - active/active and active/passive - ensure your network is always up and running. Buy two M200s or M300s for a high availability pair and receive 50% off the cost of the second device. VPN Setup in Seconds - Nothing could be easier than our drag-and-drop Branch Office VPN setup - three clicks and your remote office is connected. Block Advanced Persistent Threats - Subscription-based APT Blocker takes over where AV protection leaves off, going after zero day threats for which there are no signatures. Data Loss Prevention - Prevent the loss of confidential data in motion with this subscription-based service. Includes built-in library of over 200 rules that allows IT to quickly create and update corporate DLP policies. Firewall throughput of up to 4 Gbps to keep traffic moving. Best UTM throughput in its class - up to 800 Mbps - even with strong security enabled. 8 Gigabit Ethernet ports support high-speed LAN backbone infrastructures & gigabit WAN connections. Application-layer content inspection recognizes & blocks threats that stateful packet firewalls cannot detect. Powerful subscription-based security services boost protection in critical attack areas for multiple layers of defense. By partnering with leading technology providers, WatchGuard is able to integrate best-of-breed security components into one platform for stronger security at big cost savings. APT Blocker is a cloud-based service that uses a combination of sandboxing and full system emulation to detect and block highly sophisticated Advanced Persistent Threats (APTs). Intrusion Prevention Service (IPS) delivers in-line protection from malicious exploits, including buffer overflows, SQL injections, and cross-site scripting attacks. Reputation Enabled Defense ensures faster, safer web surfing with cloud-based reputation look-up. Data Loss Prevention automatically inspects data in motion for corporate policy violations. RapidDeploy™ enables quick, secure configuration at remote locations without technical staff. Extend best-in-class UTM security to the WLAN by adding WatchGuard's Wireless Access Points. WatchGuard offers the most comprehensive portfolio of network security services, from traditional IPS, GAV, application control, spam blocking, and web filtering to more advanced services for protecting against advanced malware, ransomware, and the loss of sensitive data. WatchGuard also offers a full suite of network visibility and management services. IPS uses continually updated signatures to scan traffic on all major protocols to provide realtime protection against network threats, including spyware, SQL injections, cross-site scripting, and buffer overflows. A powerful, cloud-based reputation lookup service that protects web users from malicious sites and botnets, while dramatically improving web processing overhead. A subscription-based service for Firebox appliances that generates a visual map of all nodes on your network so you can easily see where you may be at risk. In addition to automatically blocking known malicious sites, WebBlocker’s granular content and URL filtering tools enable you to block inappropriate content, conserve network bandwidth, and increase employee productivity. Selectively allow, block, or restrict access to applications based on a user’s department, job function, and time of day and to then see, in real-time, what’s being accessed on your network and by whom. Leverage our continuously updated signatures to identify and block known spyware, viruses, trojans, worms, rogueware and blended threats - including new variants of known viruses. At the same time, heuristic analysis tracks down suspicious data constructions and actions to make sure unknown viruses don’t slip by. Real-time spam detection for protection from outbreaks. Our spamBlocker is so fast and effective, it can review up to 4 billion messages per day. APT Blocker uses an awardwinning next-gen sandbox to detect and stop the most sophisticated attacks including ransomware, zero day threats and other advanced malware. This service prevents accidental or malicious data loss by scanning text and common file types to detect sensitive information attempting to leave the network. Access Portal provides central location for access to cloud-hosted applications, and secure, clientless access to internal resources with RDP and SSH. Correlate network and endpoint security events with enterprise-grade threat intelligence to detect, prioritize and enable immediate action to stop malware attacks. Improve visibility by evolving your existing security model to extend past prevention, to now include correlation, detection and response. Reduce malware infections by detecting and blocking malicious DNS requests, redirecting users to a safe page with information to reinforce security best practices. Dimension translates data collected from all appliances across your network into actionable network and threat intelligence. Dimension Command gives you the power to take action to mitigate those threats instantly, from one central console. Simplicity is our mission at WatchGuard and that mission extends beyond how the product is built to how it is packaged. While all of our services are offered à la carte, we have worked to develop two packages that simplify the decision-making process. The Total and Basic Security Suite packages are available on our Firebox T and M Series appliances, as well as our Firebox Cloud and FireboxV virtual models. 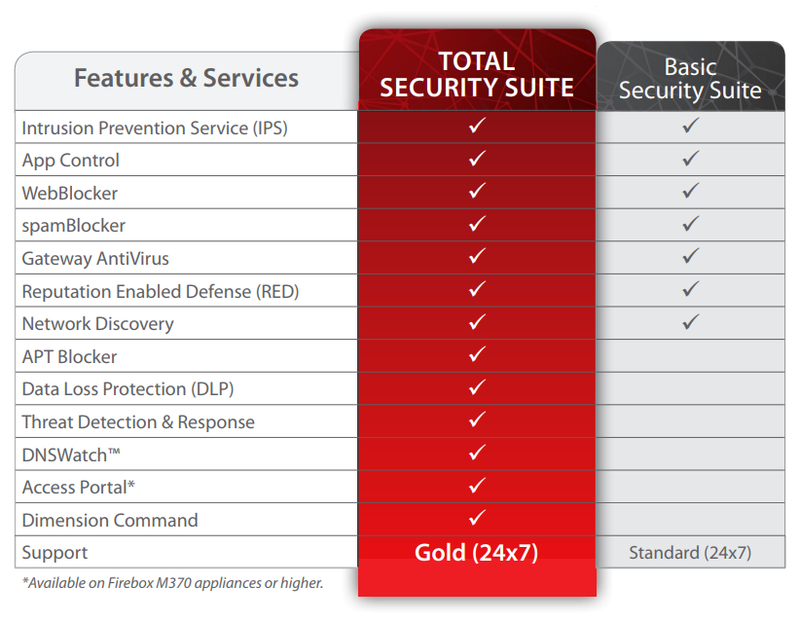 The Total Security Suite includes all services offered with the Basic Security Suite plus advanced malware protection, data loss protection, enhanced network visibility capabilities, a secure access portal, and the ability to take action against threats right from Dimension, our network visibility platform. Download the WatchGuard Firebox M200 & M300 Datasheet (PDF). *This unit must be used in conjunction with an active non-HA Firebox M200 appliance. Total Security Software Suites include Gold Support, Basic Security Suite, APT Blocker, Data Loss Prevention, Dimension Command, Access Portal, DNSWatch, and Threat Detection & Response. Basic Security Software Suites include Standard Support (24x7), Application Control, WebBlocker, spamBlocker, Gateway Antivirus, Intrusion Prevention Service, Reputation Enabled Defense, and Network Discovery. Standard Support includes 24x7 support with unlimited incidents per year, 4 hour critical/high, 8 hour medium, 24 hour low targeted response times, advanced hardware replacement and software updates and patches.